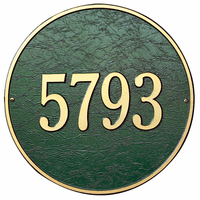 Each plaque is crafted from rust-free recycled aluminum. Paints have been specially formulated and weather tested to withstand the harshest elements. Many of the plaques are designed to provide maximum visibility to meet local 911 emergency standards. 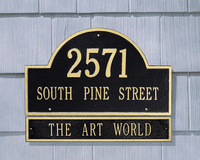 Architectural Arch Marker-Standard 15.75" x 9.25 "
Standard Plaques are perfectly suited for the average home! 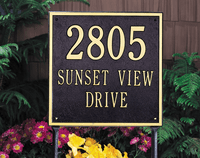 Estate Plaques are proportioned for larger homes with expansive yards! 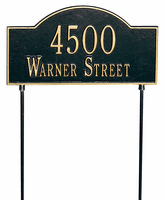 Architectural Arch Marker - Petite 8" x 4.75"
Petite plaques are ideal for smaller areas! The stately Admiral design architectural plaque! 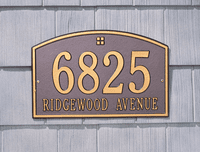 Handsome Cape Charles Architectural Plaque! 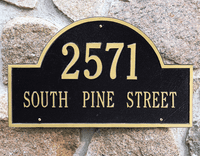 Handsome Double Line Architectural Plaque! Handsome Egg and Dart Architectural Plaque! The elegance and charm of Italy with the Florence Architectural Plaque! The very stately Hampton Standard Plaque! The handsome Roanoke Architectural Plaque! The handsome Richmond Horizontal Architectural Plaque! French grandeur with the Versailles Architectural Plaque!